Today was FARM DAY! 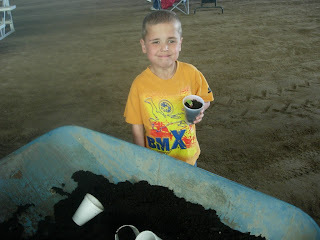 If it isn't enough that we already live on a farm, we dedicated a whole day to FARMS today. It was actually quite the production, and I was very impressed, along with all the other first graders in my group. We started out with a VERY, VERY noisy bus ride up to the fair grounds. 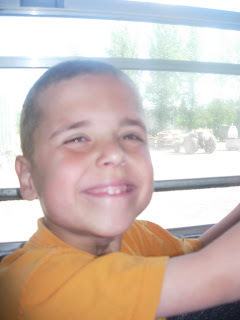 Conner was SOOO excited to ride the bus. He boarded up and got a seat by the window, his favorite spot, and off we went! 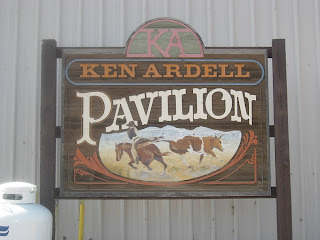 They had several stations we went to visit, they all talked about something different from the pud and electrical safety to pigs, petting zoo's , and flower transferring. Our first stop was the fire trucks. 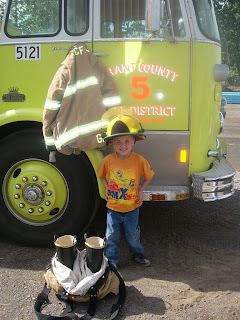 the fireman was there to let the kids jump all over them and he let Conner put on his hat! Our second stop, and a few others as well, were tractors! 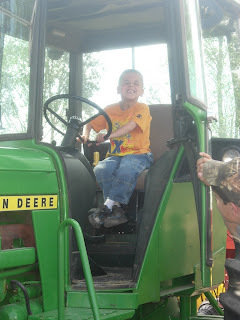 Conner loves tractors. This one was a hay baler. They taught the kids what good hay looked like verses bad hay, and what they used it for. Very informative I thought. The wheel on this tractor was huge! Conner had to get his picture! And yes, Conner had to ride it too! Look at that satisfaction written all over his face! We could have stopped there, and he would have been satisfied, but we still had to watch the pud demonstrate a squirrel getting zapped! No photos, sorry. Potato sack races were among the other stations we visited. 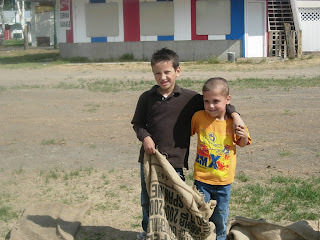 We sampled potato chips, learned how they make em' and then off in the sacks we went. It was fun to see all the kids trying to do this. After a visit with Les Schwab about tires, learning about miniature ponies, feeding cows, coloring, learning about dogs, listening to a story, and learning about gas pipe lines, we made our final stop to transplant a plant. It was really fun and the kids liked this station a lot. We had so much fun at farm day and after a bus ride back and lunch, the kids were off back to school! Thanks to everyone who helped with this event, it was great. How fun!!! Makes me miss Moses after all :) See ya soon! That was such a fun post! What a cute mom to volunteer to be a field trip helper! 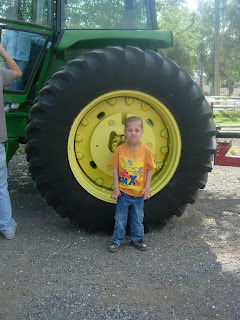 I bet Conner loved having you there to take his picture by all his favorite things (tractors...). conner looks so cute! I like his hair cut and he definately looks like he had a great time! Wow That looks like a ton of fun. I can't wait for Michaella to start going on field trips. I think it's awesome you live on a farm. What does your husband do for work. If I recall he was training to be a mechanic of some sort. Is this correct? Love 1st grade field trips. It's all about the fun!